On the night of March 23, the Queen Victoria statue on McGill’s campus was doused with green paint. This statue, along with the James McGill statue, has been covered in paint several times over the past year. A group called the “Delhi-Dublin Anti-Colonial Solidarity Brigade” claimed responsibility for the act, stating, “this year we decided to wait one week after St. Patrick’s Day, to better time our action with anti-racist organizing in Montreal,” in reference to the March 24 Mass Demonstration Against Racism and Xenophobia. The Queen Victoria statue, which was erected in 1900, stands today as a constant reminder of the centuries of imperial violence enacted across the globe by the British Empire, not least in Montreal. Colonial statues, and the entirety of the McGill campus, are situated on unceded land that was violently stolen from the Kanien’kehá:ka by colonizers like Queen Victoria. 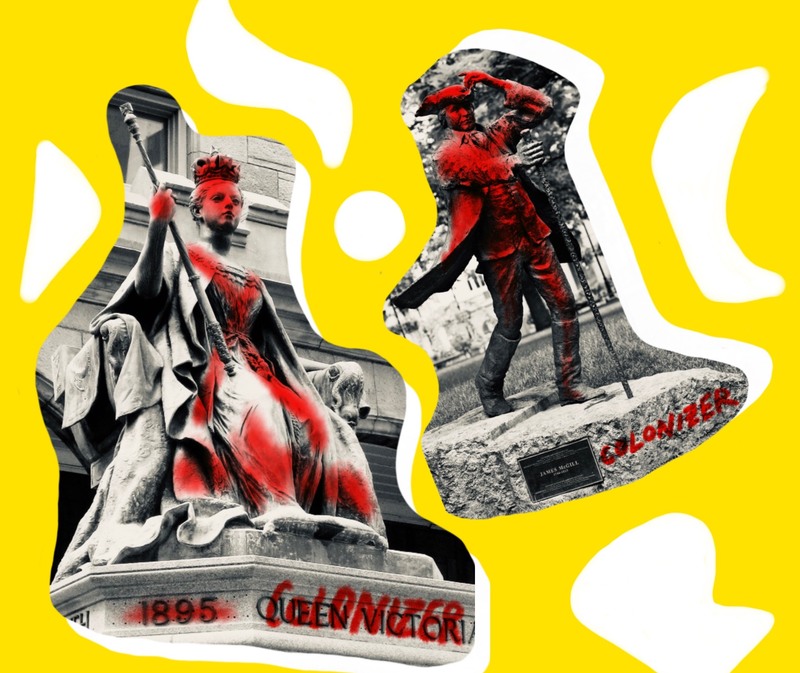 The statues of Queen Victoria, James McGill, John A. Macdonald, and other racist and colonial figures plague Montreal, despite numerous Indigenous and other activist groups asking the city to take them down. John A. Macdonald is commemorated by a monument in Place du Canada, despite having actively perpetrated genocide against Indigenous peoples through measures such as residential schools and the promotion of an “Aryan Canada.” In the words of the Delhi-Dublin Anti-Colonial Solidarity Brigade, “public space should celebrate collective struggles for justice and liberation, not white supremacy and genocide.” To give colonizers validation through grand monuments is to honour the historical and ongoing violence that their legacies perpetuate. Using paint has been an effective part of campaigns to remove racist statues elsewhere. In Halifax in May 2016, protestors doused a statue of Edward Cornwallis in red paint. Cornwallis was responsible for the “scalping proclamation” that offered cash rewards to anyone who killed a Mi’kmaq person. That action, combined with years of protest, led to the removal of the statue in 2018. Protestors in the US have also had success after employing similar techniques: a Confederate monument was removed from a Los Angeles cemetery after activists spray-painted the word “no” onto it, and a monument to Confederate soldiers in Maryland was removed after protestors spray-painted the phrase “Black Lives Matter” onto it. The statues on campus and around the city stand at the expense of Indigenous peoples and their sovereignty. By refusing to take them down, McGill and the city of Montreal continue to perpetrate anti-Indigenous racism and to marginalize those who are harmed by the realities of colonialism and white supremacy. The “vandalism” of public monuments represents the denunciation of a shameful legacy of racist and violent colonialism. It is a refusal to continue to tolerate white supremacist self-congratulation. Statues created to honour imperialists and white supremacists have no place in public spaces. As members of the McGill and greater Montreal community, we must be vocal in our denunciation of colonial monuments on campus and elsewhere. We cannot go on walking past these statues every day or taking pictures of them as if they are not explicit, concrete symbols of colonial violence. Instead, choose to actively oppose these racist statues in whatever way you see fit.